Wee Jas, the Witch Goddess, occupies a unique position in the magical pantheon of deities and demigods. She dwells in blood, death and magic, but is not inherently evil. Her followers and clerics, most of them necromancers and powerful wizards, are some of the most dangerous men (and women) alive (and dead). 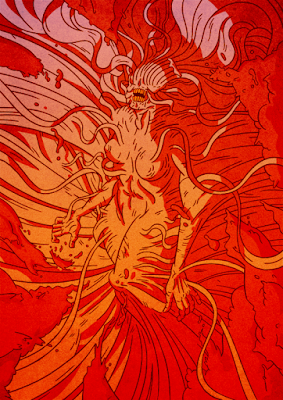 She is distinguished from other gods of death such as Nerull (Foe of all Good and Enemy of Life) by the fact that she venerates death as an inevitability, rather than something to be cheated or dealt out wantonly. The dead are taught to be respected and remembered, that the living may be treated the same way in turn when their time comes. Her alignment is Lawful Neutral, and her favoured weapon is the dagger. To commemorate this blog's continual maintanance for ONE WHOLE YEAR (! ), this weeks' "creatures" (can we call them that?) are actually Gods from the main D&D pantheon. Blanca and I have illustrated gods that are on pretty differing ends of the spectrum so it's interesting to see how they've turned out. This depiction of Wee Jas is a little unusual if you've ever seen any literature on her, which mostly describes her as a beautiful, red-headed woman with skull-themed jewelery. I'm not a fan of depicting gods as visually identical to humans, though, they need to be a little more abstract or symbolic to pack more of a punch. This actually affects pretty much all of the gods as listed in the Deities & Demigods book - most of them are illustrated in the same manner you'd draw an ordinary PC; you might not even get that they were deities if you weren't told so. 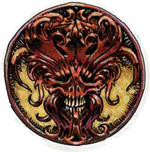 In contrast, there's this one little icon of Wee Jas in the Player's Handbook that I really like - it has the look of a skull, but it also has these weird flame/tendril/ribbon things that seem to grow out of it, getting this combination of magic-plus-death that for me sums up the goddess. 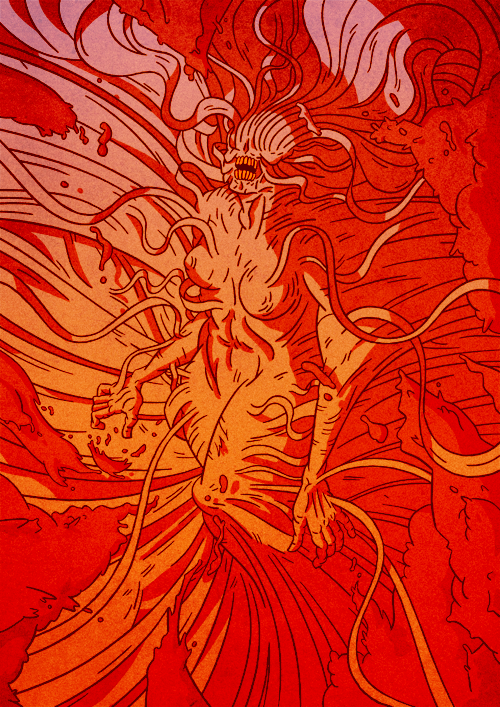 I based my design on that, trying to depict the Ruby Sorceress in a flayed, corpse-like body, roiling in gory magic, deep in her home dimension of Acheron. I love this goddess! Congratulations on your first year! So much for Death & Magic being beautiful! Well done. I hope you are doing these for some time to come!